Windmills and watermills are a ‘signature’ element in the rural landscape of southern England, celebrated by artists and travel writers alike. Think of Flatford Mill, or Ivinghoe Windmill set dramatically on the Chiltern scarp above Ivinghoe. They are more than picturesque relics – over a hundred watermills and windmills in over eight parishes once played a critical role in Bedfordshire’s rural economy. Many of those which existed before 1939 are long gone, but some do survive in a well-preserved state and can visited – Stevington Windmill and the watermills at Bromham and Stotfold. In The Windmills and Watermills of Bedfordshire – past, present and future, Hugh Howes celebrates those which have survived, and those ‘gone but not forgotten’. This paperback volume is authoritative and well-researched, but written in a very accessible style, with many excellent photographs, as well as several delightful scale and sectional drawings of mills by the late Peter Dolman, O.B.M. Hugh begins the story of flour milling in Bedfordshire, tracing the development of mills from their early history. He notes that the sites of Bedfordshire water mills are very ancient – he did not find one water mill which had not been mentioned in the Domesday Book. Between the river valleys, wind power was used – Bedfordshire was early in using the new technology of post mills. There was a windmill at Leighton Buzzard by 1212 and further ones elsewhere in the 1220’s and 1230’s. They were mostly light, simple structures that could easily be built, moved elsewhere or taken down. One post windmill at Sundon was moved to Toddington in 1847. There are records of at least 140 windmills in Bedfordshire, but only Stevington has survived complete. The period 1750-1850 is often described as the “golden age of milling”, and most mills were rebuilt to accommodate the latest technology. The windmills at Bolnhurst, Keysoe, Riseley and Stevington date from this time, as do most of the Upper Ouse watermills, Hyde Mill on the Lea, and the Flit mills at Flitwick, Maulden and Clophill. Changing economic conditions, overseas imports, the development of highly efficient steam-driven mills and falling prices from the mid-19th century increasingly proved fatal for small mills. Some millers adapted successfully, upgrading equipment; success was more likely where – as on the River Ivel – there was a constant flow of water even in summer. Many of the water mills were rebuilt in the Victorian period on a more industrial scale – large, factory-like, mostly of four storeys, built in brick and slate. Stoke Mills is a typical example. Their decline was rapid, however, after 1945. Jordans at Holme Mills is now the only surviving set of roller mills in the county. 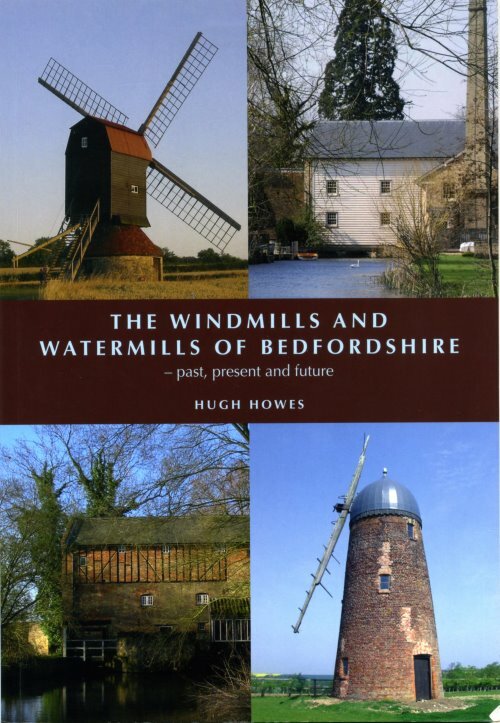 Having charted the history of Bedfordshire’s mills, Hugh Howes follows with a chapter on “The Miller at Work”, describing in some detail mill technology, milling processes and what it was like to work in a mill. This section has clearly been well-researched and is illustrated by archive photographs, but is probably more for the enthusiast. Of more general appeal are likely to be Hugh’s guides to the three mills open to the public – Stevington Windmill, Bromham Watermill and Stotfold Watermill. These provide the best descriptions and guides to these mills I have seen. He sets out the history of each mill, what to see, and accompanies these with excellent black and white and colour illustrations. This chapter alone would be sufficient reason to buy the book, which could easily be fitted into a back pocket when going on a Spring or Summer visit. Hugh concludes with two chapters recording those windmills and water mills which not open to the public, the remains of which survive (e.g. Sharnbrook, Stanbridge, Thurleigh, Dunstable, Upper Dean and Houghton Conquest windmills, and Turvey Watermill, Stoke Mills at Sharnbrook, Astwick Mill, Holme Mills, Langford Watermill, Ivel Mill at Biggleswade, Flitwick Watermill, Barton Mill, Hyde End Mill, and Doolittle Mill, Totternhoe); lastly, there is a roll-call of those mills “Gone but not forgotten” – again well-illustrated. In short, this is probably one of the best provincial guides to wind and water mills to have been produced in recent years. It is well-written, well-researched and well-illustrated, and a bargain at £8.99. Well worth buying and browsing to plan trips next year to see an important part of Bedfordshire’s rural heritage.